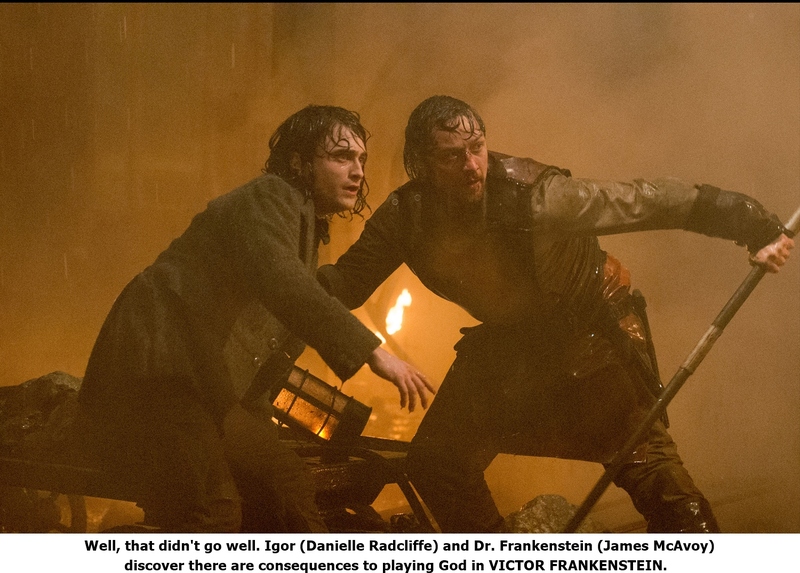 Screenwriter Max Landis and director Paul McGuigan would recognize that tip of the hat to Mel Brooks’ Young Frankenstein, but then they do that themselves in the course of Victor Frankenstein, their take on Mary Shelley’s classic tale that is part horror, part sci-fi/fantasy, part black comedy, part romance and part Victorian era buddy picture. For a while, McGuigan is able to keep all his balls in the air and this reimagining of the Frankenstein legend that is told from his assistant Igor’s point of view starts off as fresh and funny. But perhaps he and Landis should have paid heed to the lessons imparted by Dr. Frankenstein’s hubris. This monster of a movie is simply grafted from too many parts and escapes its makers’ control, falling flat in its last act when it morphs into yet another genre, a tired action movie. Ultimately, the experiment fails. Daniel Radcliffe plays a nameless circus clown known only as “Hunchback,” an abused object of scorn who possesses a physical deformity and a brilliant mind. His is a life of misery, relieved only by his crush on aerialist Lorelei (Jessica Brown Findlay) until the day Victor Frankenstein (James McAvoy) visits the circus. Victor recognizes Igor’s intelligence as well as the nature of his deformity. He rescues the young man; takes him into his own home; lends him the name of a long-absent roommate, Igor; and reinvents him as a young dandy. There is a price to be paid for this kindness as Igor becomes Victor’s partner in his reanimation experiments. Lorelei and Inspector Turpin (Andrew Scott), a Scotland Yard police detective convinced Victor is up to no good, warn Igor against his new friend. Igor himself has misgivings about the nature of Victor’s work in bringing the dead back to life, if not Victor himself, but he is also loyal and grateful to Frankenstein for all he’s done for him. This is a gorgeous film with handsome cinematography by Fabian Wagner and sublime production design by Eve Stewart that is a magnificent evocation of the sleazy glamor of the circus, the bustle of Victorian London, the clutter of Victor’s digs, and the madness of his laboratories.